A tipi of the Nez Perce tribe, circa 1900. A tipi (also teepee, tepee) is a conical tent originally made of animal skins or birch bark and popularized by the Native Americans of the Great Plains. Tipis are stereotypically associated with Native Americans in general, but Native Americans from places other than the Great Plains used different types of dwellings either in addition to, or instead of, tipis. The term wigwam is sometimes incorrectly used to refer to a dwelling of this type. The tipi provided the essentials of shelter, particularly for nomadic peoples: It is durable, provides warmth and comfort in winter, remains dry during heavy rains, and is cool in the heat of summer. Tipis could be disassembled and packed away quickly when a tribe decided to move and could be reconstructed quickly when the tribe settled in a new area. This portability was important to those Plains Indians with their nomadic lifestyle. Tipis also reflect the spirituality of those who used them, their circular shape symbolizing sacred space. When decorated by painting or ornaments, they could take on meanings related to the individual or family who lived in that tipi, or the social group as a whole. Although by contemporary standards the tipi appears primitive, and the Europeans who encountered them when traveling through their lands certainly regarded them as such and their inhabitants as "uncivilized," the tipi is in fact a remarkable example of human creativity. Using materials available to them, tribes were able to fashion dwellings that satisfied all their needs. Unfortunately, the so-called "civilized" dwellings that they were forced to live in on Indian reservations often proved less satisfactory. The word tipi also spelled "teepee," comes into English from the Lakota language; the word thípi consists of two elements: the verb thí, meaning "to dwell," and a pluralizing enclitic (a suffix-like ending that marks the subject of the verb as plural), pi, thus meaning, "they dwell." In Lakota, formal verbs can be used as nouns, and this is the case with thípi which in practice just means "dwelling" or "house." 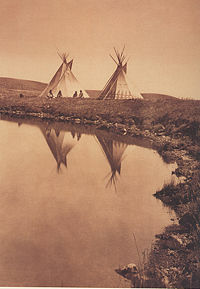 The tipi is typical of Plains Indians culture, but was also used by other tribes due to the ease of dismantling and transporting them (Zimmerman and Molyneaux 2000). Tipis painted by George Catlin, who visited a number of tribes in the 1830s and recorded Native American daily life. Tipis consist of four elements: A set of ten to twenty sapling poles (depending on the size of the tipi), a canvas or hide cover, an optional inner canvas or skin lining, and a canvas or skin door. There may also be an optional partial ceiling. As many as 28 buffalo hides could be used to construct the cover (Waldman 2006). Tipis are distinguished from other tents by two crucial innovations: The opening at the top and the smoke flaps, which allow the dweller to cook and heat themselves with an open fire while providing a source of fresh air to fire and dwellers. They also have a lining that is used primarily in the winter, acting to insulate the inside of the shelter from the cold. Ropes and pegs are required to bind the poles, close the cover, attach the lining and door, and anchor the resulting structure to the ground. Tipi covers are made by sewing together strips of canvas or hide and cutting out a semicircular shape from the resulting surface. Trimming this shape yields a door and the smoke flaps that allow the dwellers to control the chimney to expel smoke from their fires. Old style traditional linings were hides, blankets, and rectangular pieces of cloth hanging about four to five feet above the ground. The poles, made of peeled, polished and dried tapering saplings, are cut to measure about six feet more than the radius of the cover. The construction of a tipi starts with tying together three of the poles at the skin's radius from their bases using a tripod lashing. One end of this lashing rope is left dangling from the tie-point, long enough to reach the base of the poles. These tripod poles are stood upright, with their unfastened ends spaced apart on the ground to form a triangle, each pole's base the skin's radius from its neighbors. A dozen more long poles are laid onto the three primary poles. Their upper ends rest on the lashing of the first three, and the lower ends are evenly spaced to form a circle on the ground which includes the original three poles. The lashing rope is then walked around the whole structure three times and pulled tight. This ties the placed poles to the tripod at the crown of the tipi. The canvas skin is tied to another pole, lifted up and the top of the pole is rested where all the poles meet. The skin is pulled around the pole framework. The overlap seam is closed with wooden lacing pins which are thin sticks about 10 inches (250 mm) long with one or both ends tapered. Sometimes a door is attached to one of the bottom lacing pins. In old tipis of hide or early cloth, the door was where the two sides came together in the front. A blanket, hide, or cloth door was put over the opening to secure the entrance. Photograph of Crow lodge interior, 1907, showing the poles and outer skin at the top, the inner lining and bedding. The lashing rope is tied off to a wooden stake at the bottom of the photograph. Clothing is suspended on a line tied between two of the tipi poles. The base of the skin is pegged to the ground. Traditionally pegs were placed in slits at the bottom of the cover. As canvas or cloth came into use loops were sewn into the bottom or, in an emergency smooth pebbles were pushed into the cloth and a cord tied between the bulge of cloth and a wooden peg in the ground. A gap can be allowed at ground level for airflow in warm seasons and the base is completely closed to the ground in cooler times. The bases of the non-tripod poles are moved in or out to tension the skin. Inside the tipi, a cord is wrapped from pole to pole above head height. An inner lining can be suspended from this cord and pushed back on the ground near the inside base of the poles. Bedding and personal items are pushed against the liner to keep it in place. The inner lining acts as a heat insulator and draft and pest excluder. An interior awning which prevents rain drops hitting bedding can be suspended at the top of the lining. The various openings could be opened or closed to adjust for ventilation, or with extra pelts added to the closed structure the tipis became warm shelters in winter weather. They were situated so as to reduce the wind factor: The prevailing winds were from the west and so the entrance faced east. By constructing the tipi to lean slightly to the east, wind pressure was reduced somewhat as the air could flow more easily over the top (Waldman 2006). A structure that requires a hole in the middle of the roof is not the best shelter in times of intense rain, but there are strategies to reduce the problem. A hide or fabric ceiling can protect against dripping precipitation. This ceiling, when used, typically only covers the back half of the tipi and is slanted slightly upwards to the front, draining water to the rear and allowing smoke from the fire to vent out of the top of the tipi. Small sticks between the lining rope and the poles can create a gap for rainwater running down the poles to reach the ground without being caught by and dripping off the lining rope. Contemporary tipi dwellers may tie a bucket beneath the crown, or install rubber barriers on the poles and a canvas rain catcher which drains from the crown to the outside, to collect rain dripping off the crown of the poles. A fabric or hide rain cap can be placed over the top of the tipi if the poles are not too long but can cause damage in high winds. Historically, these types of coverings were not used. In strong winds the lashing rope is pegged to the ground behind the fire. This helps to keep the tipi poles from “walking”—lifting up under the force of the wind on the skin and coming down in a new position. In extreme winds the bases of the poles can be individually lashed to pegs. A tipi which is pegged and has had its lashing rope tied down is a remarkably wind-resistant cone. 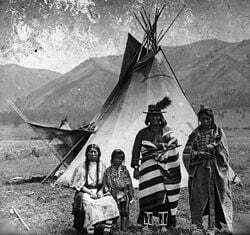 Flathead family outside their tipi. A small fire can be set in the center of the floor of the tipi for heat or cooking. The smoke exits the top of the tipi which is guarded by two adjustable smoke flaps set at right angles to the wind to prevent a downdraft. A draft rising between the cover and the lining adds to the chimney effect and helps carry the smoke up and out. The liner adds insulation in very cold weather when stuffed with grass and can direct the draft upwards and away from the occupants while still admitting fresh air. Air for combustion can be ducted to the fire through a buried pipe when the tipi is closed tightly against inclement weather. In most weather the lining may not be used, and the cover can be rolled up on very hot days a few feet on one or two sides allowing any small breeze, creating ventilation. Tipis are designed to be easily set up to allow camps to be moved to follow game migrations, especially the bison. The long poles could be used to construct a dog- or later horse-pulled travois. Once horses had been introduced to the Plains Indians, they became mounted nomads. 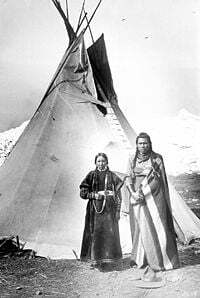 The portable tipi, easily disassembled and transported, and an effective shelter in all types of weather, became their ideal dwelling. For the Plains Indians, the tipi was more than just a home—it was a sacred space. For the Plains Indians, the tipi was more than just a home—it was a sacred space. The circle, a sacred symbol of the inter-connectedness of all things, is the basic shape, the foundation of the tipi. The floor symbolized the earth and the walls the sky. A small altar built of stone or earth was used for burning incense during prayer times. Inside and outside walls could be painted with symbolic designs—spirit beings, ancestors, and honors gained in battle were common (Waldman 2006). At the Water's Edge- Piegan (Blackfeet) Tipis. Photography by Edward S. Curtis, 1910. Ceremonies and prayers were first offered, and then the dreamer recounted his dream to the priests and wise men of the community…. Those known to be skilled painters were consulted, and the new design was made to fit within the traditional framework of [the tribe’s] painted tipis (Goble 2007). Modern tipi covers are usually made of canvas. Contemporary users of tipis include historical reenactors, back-to-the-land devotees, and Native American families attending Powwows or Encampments who wish to preserve and pass on a part of their heritage and tradition. The tourist industry has also taken up the idea of using tipis in amusement parks and exhibition sites. Arapaho camp by William S. Soule, ca. 1870. Native American Indians of the Columbia Plateau on horses in front of tipis, 1908. 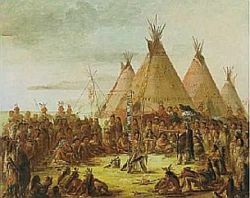 Indian encampment on Lake Huron, 1848–1850. Oil on canvas. Looking Glass, a Nez Perce' chief, on horseback in front of a tepee. Photograph, 1877. Salish men on July 4 stand by tepees near St. Ignatius Mission, Flathead Reservation, Montana, 1903. Shoshoni Indian gathered around tipis. Little Big Mouth, a medicine man, seated in front of his lodge near Fort Sill, Oklahoma, with medicine bag visible from behind the tent. Photographed by William S. Soule, 1869-1970. Site amérindien Mokotakan, juin 2007. Karl May Museum in Radebeul, Dresden, Germany, August 2005. Big Tipi at Expo 2000, Hanover, Germany. A tipi at the Rainbow World Gathering near San Vito, Costa Rica, March 2004. Tipis outside the Buffalo Bill Historical Center, Cody, Wyoming. Big Tipi in Fredenbaumpark, Dortmund, Germany, based on Big Tipi at Expo 2000 in Hanover. Goble, Paul. 2007. Tipi: Home of the Nomadic Buffalo Hunters. World Wisdom. ISBN 193331639X. Holley, Linda A. 2007. 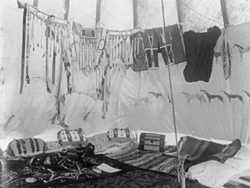 Tipis, Tepees, Teepees: History, Design, and Evolution of the Cloth Tipi. Gibbs Smith. ISBN 978-1586855116. Laubin, Reginald, Gladys Laubin, and Stanley Vestal. 1989. The Indian Tipi: Its History, Construction, and Use. Norman, OK: University of Oklahoma Press. ISBN 0806122366. Zimmerman, Larry J., and Brian Leigh Molyneaux. 2000. Native North America. Norman, OK: University of Oklahoma Press. ISBN 0806132868. All links retrieved June 24, 2014. Simply Differently.org: Tipi. Tipi building resource, how-to manuals and online calculator for canvas lanes. Tipi Instructions. A PDF document detailing the construction of a tipi. This page was last modified on 24 June 2014, at 23:09.